A quintessential Indian family often spends several years in a rental home before they move into a home of their own. Rental properties are hugely in demand in a country like India where the population is so high that even the tiniest apartments in the remotest area sell like hot cakes. Over the years, the owners as well as the tenants have become more aware of their duties and responsibilities and with that came the need of a good rental agreement. 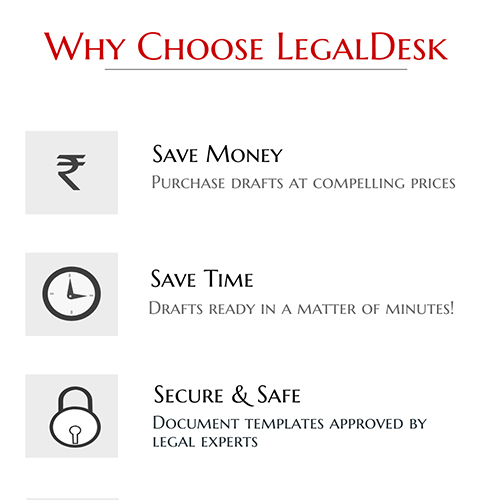 Drafting any valid legal document has always been considered a task for the lawyers, but the last few years saw a shift from that trend. More and more homeowners have opted to oversee or draft the document themselves because only you can understand your needs best. For those among you who are looking for the best way to draft one yourself, we’re glad to tell you that pre-drafted, easy to create rental agreements are now available with us. Moving on, rental deeds can be tricky to construct. Both tenant and owner must make sure that they’ve included all the points relevant to both parties to avoid ugly battles and Bollywood style fights later. 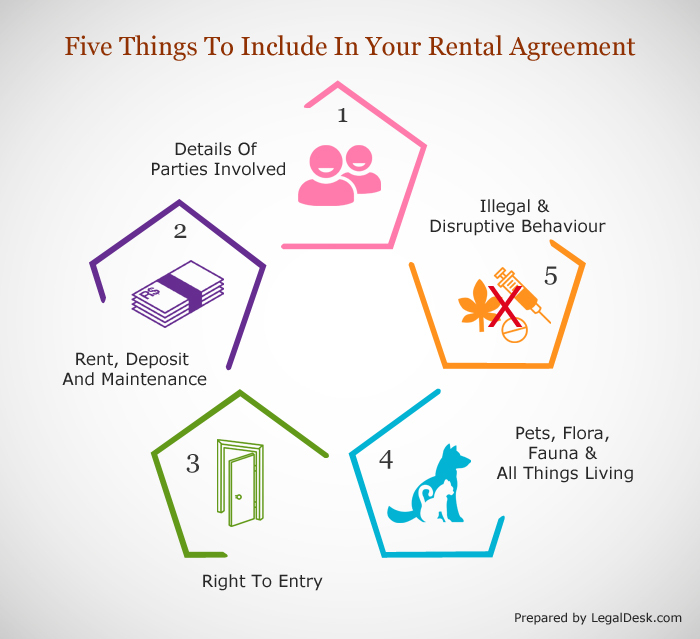 So let’s take a look at five things that must be covered in a rental document. What Should Be Included In A Rental Document? This one is a no brainier, but it’s hard to avoid. While everyone knows that it is vital to include names of all tenants and the name of the owner himself, not many are aware of the implications that follow when it is not done properly. Spellings, precise details of address, related information play a vital role. A good rental deed will require that the monthly rent, deposit to be paid in advance and maintenance charges (if any) to be clearly stated in fine print. You also need to make sure that you write down that the owner cannot just abruptly change the monthly rent during the duration of the lease. It will also be helpful if you got it in writing that the owner will return the deposit amount to you as and when the tenant vacates. What if the owner tells you that he won’t return your money because there is no written document saying that he should give the deposit back to you? You shall find yourself in a very frustrating situation then. Write down, word by word, the conditions under which the owner can barge into the tenant’s space. Clauses like “the owner can visit the said premises as and when he sees fit” are dangerous. You will not be able to do anything if he comes into your home in the middle of the night. Hence, the need for clarity on this. Some like pets while some others dislike the very idea of having an animal within their abode. Agreements are to clearly mention whether pets are allowed. And if they are allowed, what kind can they be and the maximum number possible. Some owners are okay with pets that can be contained to a particular area like fishes, birds or even turtles. Some owners are totally fine about bigger and messier ones like canines, felines and get this, reptiles. This one is for the protection of the owner mostly. Should either party indulge in scary and downright illegal/immoral behaviour, the contract should mention what actions will be undertaken against such behaviour. A possible way to avoid this it to clearly mention what kinds of behaviour should be avoided and what the repercussions would be. There are five of the most essential things in a rental deed. Would be best if you add a clause stating that addition or removal of clauses can happen only with the consent of all parties involved. How To Make A Rental Agreement Legally Valid And Enforceable? Like most other legal documents, the rental deed too must be printed on stamp paper of required value. Once you have printed the document on stamp paper, place the signatures of parties involved and two witnesses on designated places. This completes the process of preparing a rental agreement. Your deed is now ready and will be held valid in any court in the country. It is recommended to pay stamp duty and register the agreement at a Govt. Registrar office. In practice, the agreements for a duration of less than eleven months are rarely registered. However, if there is dispute later on and if you approach the court, you will be asked to pay a penalty of 10 times the applicable stamp duty before the case can be heard. We strongly recommend that you take a look at our comprehensive, pre-drafted, lawyer verified rental deed that focuses on all possible events and contingencies. We also have the facility to print the deeds you need on stamp paper and deliver it to an address of your choice. We also take this opportunity to inform you that we have a host of other legal documents which can be easily customized to suit your requirements. Good luck dear reader, we hope your pursuit for the ideal rental home, bears fruit. Apart from the things discussed above, there are a few other things that both owner and tenant needs to know about the deed they are entering into. Here are some facts that you must keep in mind for your own good. Rental deeds are subject to national legislation. This means that parties involved cannot act in a way that restricts basic rights. The owner should avoid including clauses which goes along the lines of something like “delay in paying for rent will result in water/ electricity being cut”. If the owner insists on including similar clauses, now would be a good time to run. You cannot evict a tenant for no apparent reason. The Supreme Court recently passed a law stating that an owner cannot evict a tenant for 5 years if the said tenant has been regular about paying rent or other bills. In short, eviction must always have a valid and strong reason behind it. Either the tenant has to be irregular about paying rent, or there has to be a breach, or there has be some illegal or immoral behaviour from the tenant’s side, or the owner has a very valid reason for eviction. For owners who are worried that their seemingly nice tenants may turn into a menace, the Leave and License agreement is a wise alternative. This is a legal document that declares that the lawful possession of the house or premises, remains with the owner. Hence, it is essentially a document that makes it crystal clear that the premises are being given to the tenant temporarily and that during the term of the lease, the owner shall continue to have possession of the property. While both rental agreement and leave and license agreement allows a tenant to occupy a premise, the latter favours and protects the owner and clearly states that there is no transfer of interest of property. Our experts say that eviction is easier if there is a leave and licence agreement in place. We have online rental agreements available now. Select your city and make your rental agreement online. We will take care of delivery, Stamp paper etc. There are 2 comments on "Five Things To Include In Your Rental Agreement".